It’s that time again! The time in each month when I design for the Around the World Stampin’ Up Challenge Blog and this month it’s a sketch challenge for a Scrapbook Page. Well, I don’t scrap, so I decided to work on a card, in my own special, simplistic style. I love working with this stamp set, Hopeful Thoughts, and it seemed to work very well for the ‘swirled’ background of the sketch. 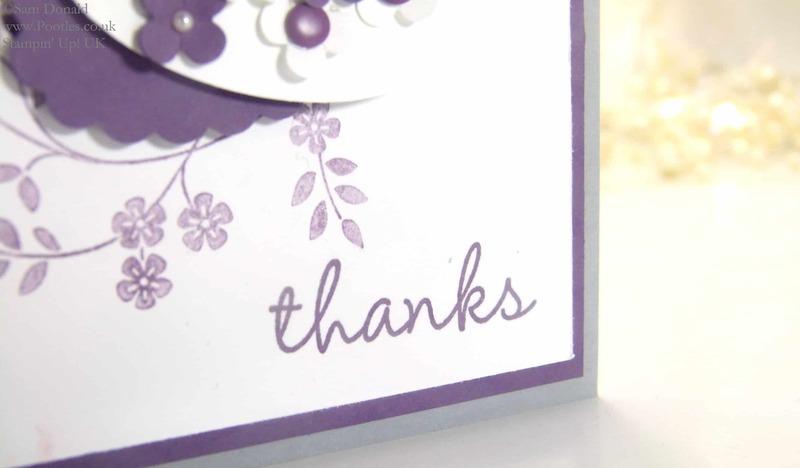 But it’s the incorporation of the ‘thanks’ sentiment that I pinched from the Hip Hip Hooray card kit that was released a few days ago that really sets this card up for me. I love the font, and it’s gentle tilt in one direction. So cute! For the record, I love the whole kit, I just haven’t had time to photograph it yet! So with the colour combination of Smoky Slate as a card blank, but inked in Perfect Plum with the addition of my punch bunch lovelies of Scallop Oval, Large Oval and Itty Bitty Shapes Punch Pack, and it’s a card I love, and I can’t wait to send it to someone! So I do hope you like my take on the scrapbook page, and do go and get yourself challenged too!